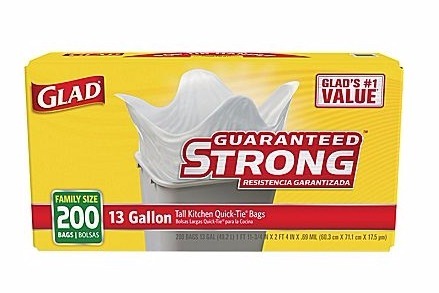 200-ct Box of Glad Tall 13-gal Kitchen Quick-Tie Trash Bags—$12.99! Stock up on trash bags for a great price at Staples right now! The 200-ct box of Glad Tall 13-gal Kitchen Quick-Tie Trash Bags is priced at only $12.99 right now! That’s just 7¢ per bag!